Happy Birthday - Guy Card! I toyed with the cupcake theme and then decided to go with the map. I used Happy Birthday from the Happy Family Days set. I stamped it with Versafine Vintage Sepia. There is nothing tricky or clever about this card. 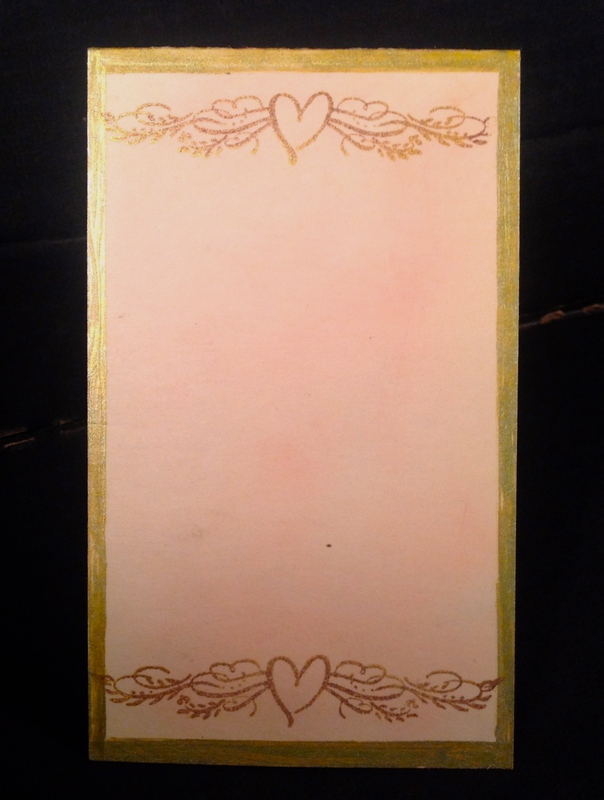 I used Spellbinders Labels 22 and positioned the die so half of it cut into the top of the decorated paper. The cut out bit was then flipped around to mask the background and I sponged around the shape with the Sponging Tool using Distress Ink pads in Brushed Corduroy and Rusty Hinge. The decorative paper was sponged with the same colours. The paper cord wrapped around the rusty heart came from Ikea (probably a million years ago....) and is called Onska. I hope that helps and gives you some ideas that you might not have had before! Here are thumbnail links for the supplies I used. Valentine's Day/Love 2013 stamps, I’ve had a plan for the larger heart. If you look closely, behind the sentiment – Happy Valentine’s Day (which was embossed in gold), you will be a very faint outline of the heart. The heart was embossed in clear on watercolor paper, then drops of Spun Sugar, Tumbled Glass and Antique Linen were applied over the embossing. In order for the background not to over-power the sentiment, I kept misting with water to saturate the colors . . . I really wanted subtle and it is. Once the paper had dried, the embossing was removed with a craft iron (Faux Bleach/Batik Technique). 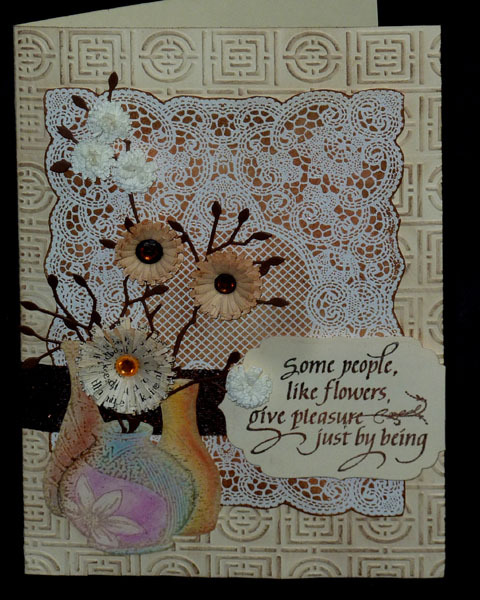 The sentiment was then die cut/embossed with Spellbinders Ovals and layered over a final background of Spellbinders Floral Ovals. The flower and leaves were made from watercolor paper. Distress Stains used for the flower were Spun Sugar, Tattered Rose and Victorian Velvet; and for the leaves Peeled Paint, Forest Moss and Vintage Photo Distress Stains. The seam binding ribbon was dyed with the same colors of Distress Stains used on the rose. That’s all for me today . . . thanks for stopping by! 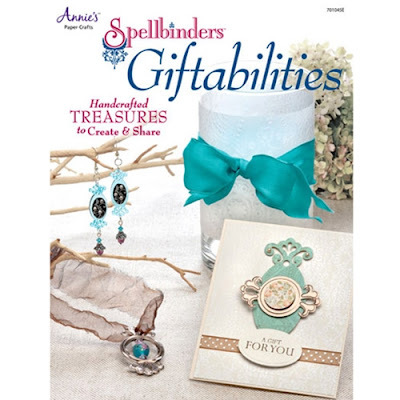 Spellbinders has just had their newest publication released titled Giftabilities. 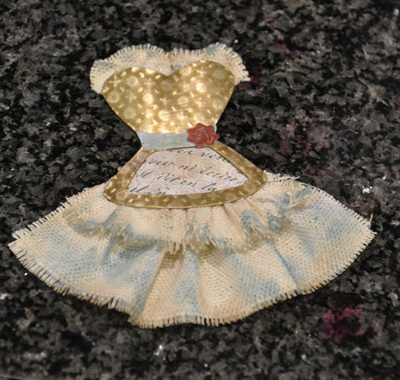 The projects included feature all type of gifts for lots of occasions and cater to all levels of expertise in crafting. There are cards, ornaments, jewelry, home decor items and more. The book includes some special techniques to try, as well. Giftabilities may be purchased from Annie's Attic. Quietfire Design is delighted to congratulate designer Judy Hayes who created a beautiful art journal which is included in Giftabilities. Judy used Quietfire's Art is Letting Your Fingers Capture on one of her pages. Thank you so much Judy! Here is a badly photographed sneak peek at Judy's creation (taken with my iPhone at night in the hotel room). 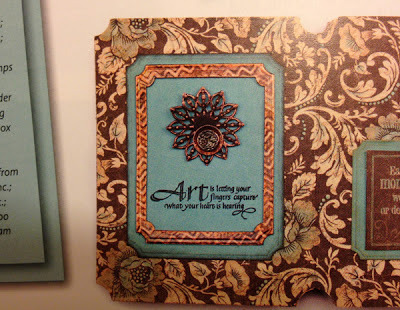 This is just one of pages in Giftabilites dedicated to Judy's amazing Art Journal! 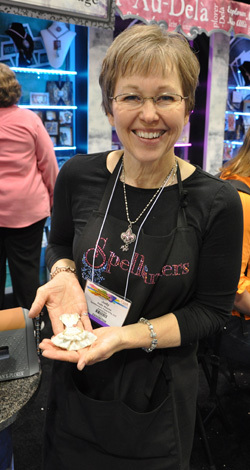 Here is Judy Hayes at CHA at the Spellbinders' Booth sharing the sweetest little creation she made with the new Media Mixage items. We'd also like to congratulate our Design Team member Sherry Cheever who had a sweet Baby Keepsake Box project included in Giftabilities! And a shout out to Design Team Alumni Darsie Bruno who also had a project in this publication. Announcing the 4th Annual Queen of Hearts Challenge! This is our 4th annual Queen of Hearts Challenge and this year we have even more for you! More opportunities to win! Here are the details – want a quick summary? Scroll down! As in previous years, we want you to make some artwork. Your artwork should have a love and/or Valentine theme. It doesn’t have to include Quietfire stamps, but we’ll love you if you use them!). On February 14th, you will put a photo of your project on your site or photo hosting page (I’m not sure Facebook will work, so don’t put it there, please! ), then you will come back to us and on our special Queen of Hearts blog page you will add the link back to your submission. Easy peasy! Don’t worry, we’ll remind you more of this soon. So what happens next? Prizes, of course. This year there will be more than ever! But first. 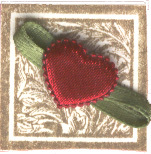 The Quietfire Designers are having a Queen of Hearts Blog Hop leading up to Valentine’s Day. Beginning on February 9 and every day till Feb 14, one (or more!) of our designers will be posting on their personal blogs. We’ll be giving you the schedule soon. 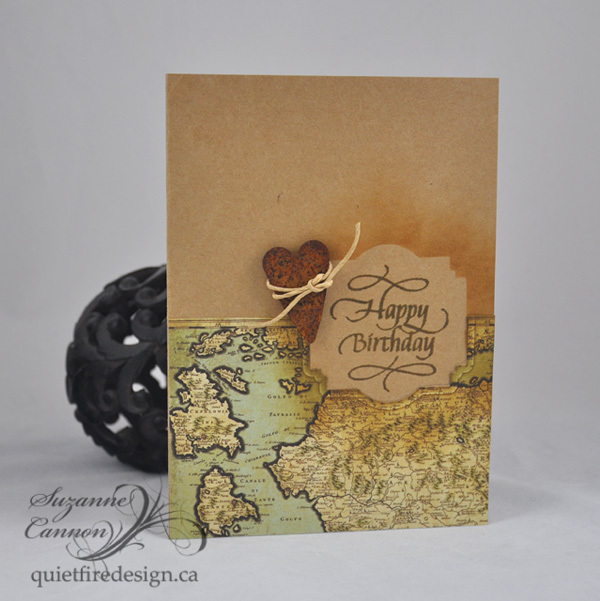 You’re going to want it, because when you comment on their Queen of Hearts blog post, you’ll be entered in a random draw to win $25 worth of Quietfire stamps. But the big prizes come when you do the work! From the February 14 submissions, there will be more than one opportunity to win. 1. There will be a random draw for $75 worth of Quietfire rubber stamps. 2. There will be voting on your favourite submission. So fire up your friends to come and vote for your submission. We’ll give you a few days after the 14th for voting. The winner with the highest number of votes will also win $75 worth of rubber stamps. 3. A prize of $75 worth of Quietfire rubber stamps given to the judges choice, so show us what you’re made of! Impress us! So start planning your artwork! More about the Queen of Hearts Blog Hop coming soon. If you'd like to see how it's done, you may visit the 2011 challenge here. Hi Everyone! This is Holly with a valentine made sweet by the beautiful sentiment stamps from the new Valentine's Day/Love 2013 stamp set. The designer paper used for the front panel was sponged along the edges with several different colours of Distress Inks chosen to match the subtle colours in the designer paper. 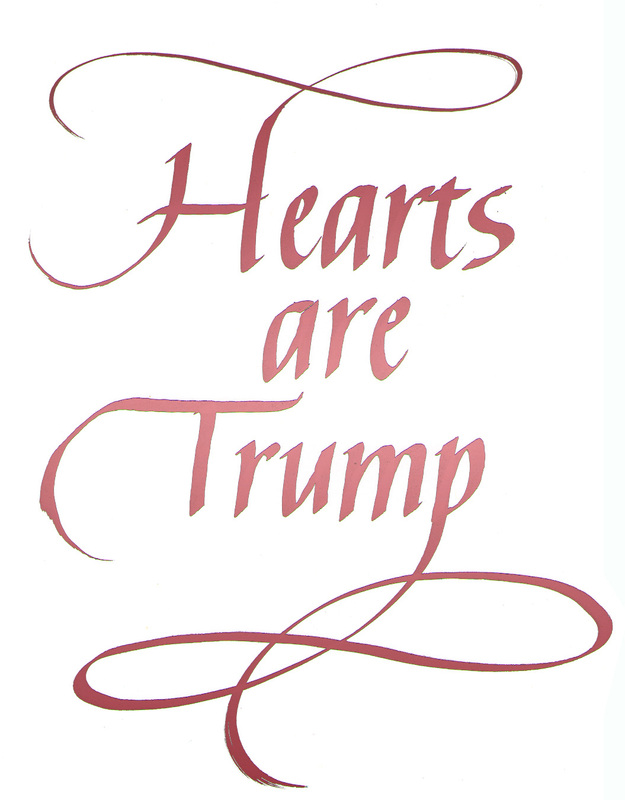 The heart was watercoloured with distress ink then hand-cut, leaving a narrow white edge. Spellbinders Hexagon was used to cut out the HVD sentiment, then it was sponged with distress ink around the edges. 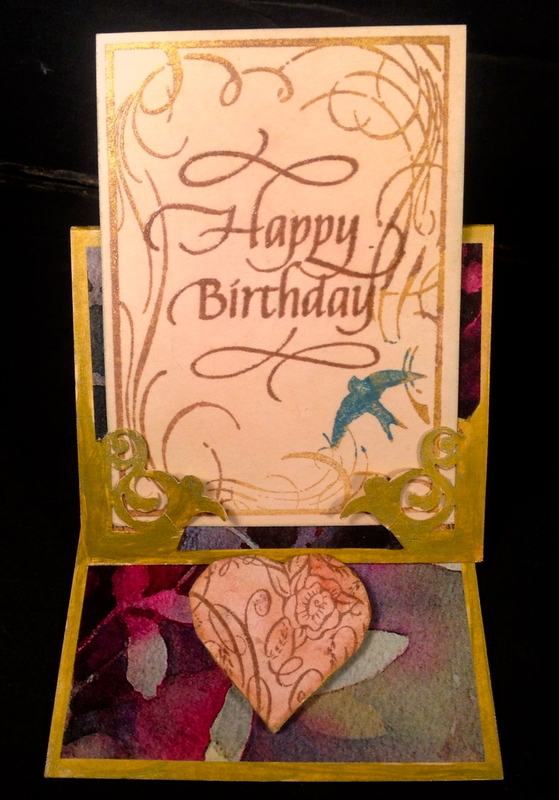 The leaves were cut with the rose leaf die from Spellbinders Foliage set, then sponged with distress inks. While still damp, a stylus was drawn along the vein lines to form a more dimensional leaf shape. After attaching the front panel to the base card, the hexagon piece was glued down. The heart and leaf stem were glued together and some leavers were cut from the stem and reassembled behind the top of the heart. This piece was glued down overlapping the edge of the hexagon. The final addition was a spritz of shimmer over the heart and dots of super sparkle along the lacey strip of the designer paper. This new stamp set is fantastic and I hope you're enjoying the various ways you're seeing it being used. Maybe inspiring you to use them too? Thank you for looking today! Hello everyone...Terre here with a creative card using Quietfire Designs "LOVE does not consist" stamp. I just received this stamp before I left for CHA and I think it is one of my new favorites..I think I say that about all of Quietfire Designs stamps...lol! You will find lots of uses for this set way beyond V-Day. 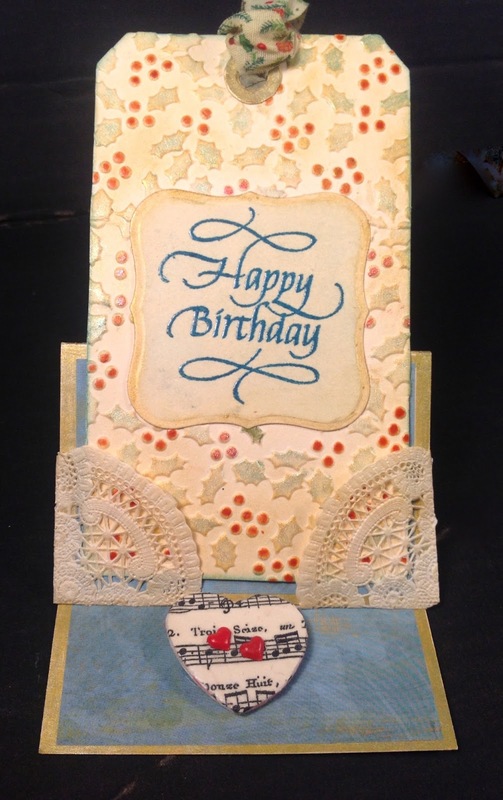 This card is ATC size, held in place with a corner punch, and has the Have I Told You on one side and Happy Birthday on the other ( check for shout outs on my blog). Stamped with Versafine Sepia, thermal embossed clear. The easel stop starts as a piece of chip board. Stamp the Flourished Heart with Versafine Sepia on heavy cream paper and mold it onto the heart chip with wet glue. 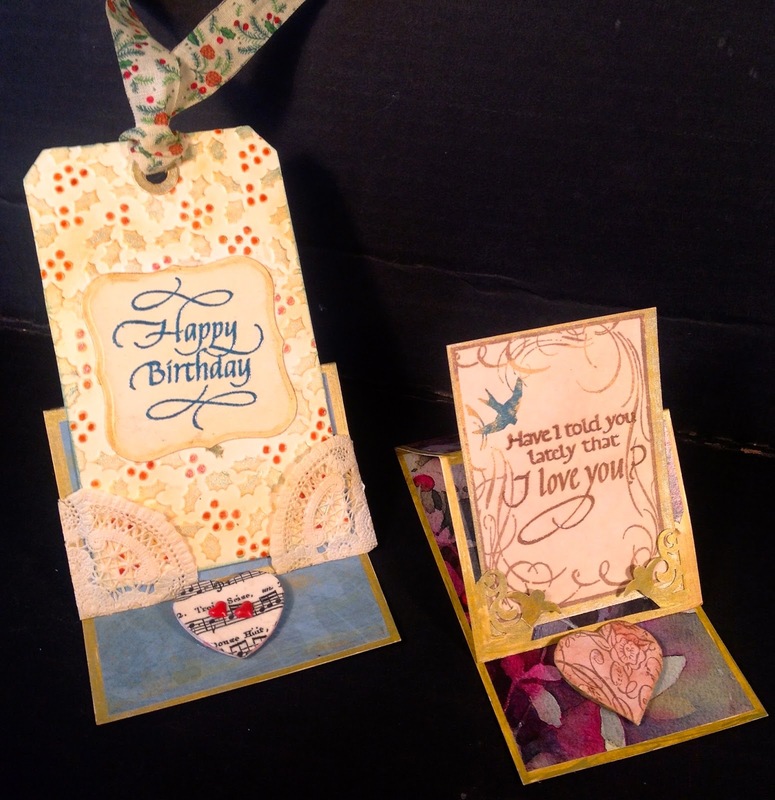 The cards are colorized with Distress Ink, Spun Sugar , Tumbled Glass and Antique Linen. Card below embossed with a Cuttlebug folder(shout out on my Blog), embellished with Spellbinders Labels One, stamped with Versafine Lagoon, thermal embossed clear. The Tag is held in place with corners cut from a doilie. 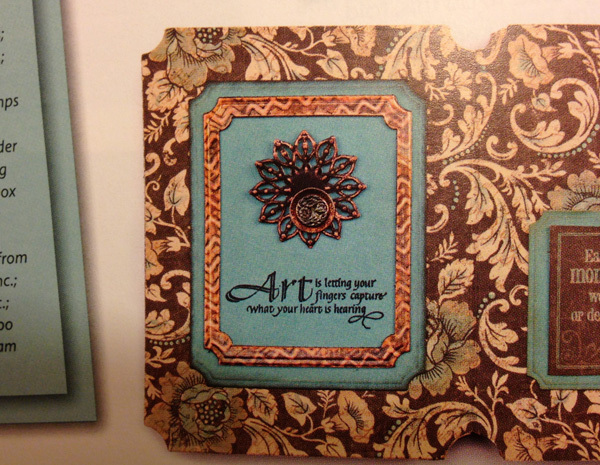 Check back hear often to see more of this beautiful and versatile stamp set from all of our talented designers. Beginning in February we will feature a technique of the month and guest designers. Good morning! 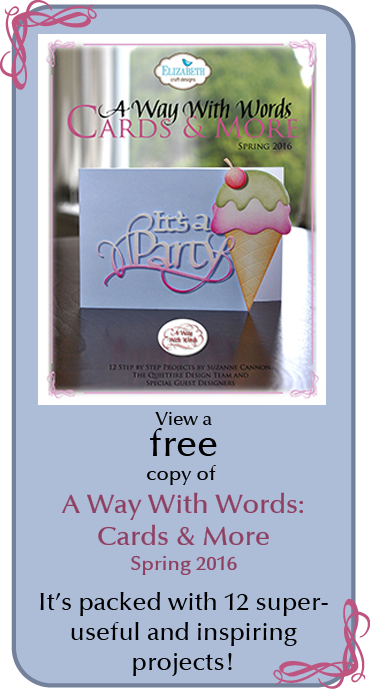 Sherry here today and I have a quick and easy card to share with you. When I first saw the new Spellbinders™ 3D M-Bossabilities™ folders, I knew that it would be a match made in heaven when teamed with the elegance of Suzanne’s calligraphy. 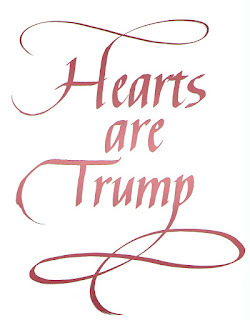 That open embossed banner on the front of the folders lends itself well to beautiful sentiments. Recently I had the opportunity to pick up the Thank You Set of 4, and it so happens that I had an idea even then for this card. The first thing I did, was die cut/embossed 3 sheets of watercolor paper using the new Spellbinders die templates for 5x7 card and for the front cover. Those dies are S6-001 5x7 Matting Basic A, S6-002 5x7 Matting Basics B and E3D-003 Delightful Daisies. All of these dies are available for pre-order here at Quietfire. The Delightful Daisies folder was inked with peach pigment ink, the smallest watercolor paper layer was misted with gold perfect pearls and water and then placed in the M-Bossabilities folder. Once the paper was embossed, it was removed, dried with a heat gun, and then the edges were inked with more of the same peach ink. The sentiment was aligned, stamped in the same peach ink and then embossed with clear embossing powder. 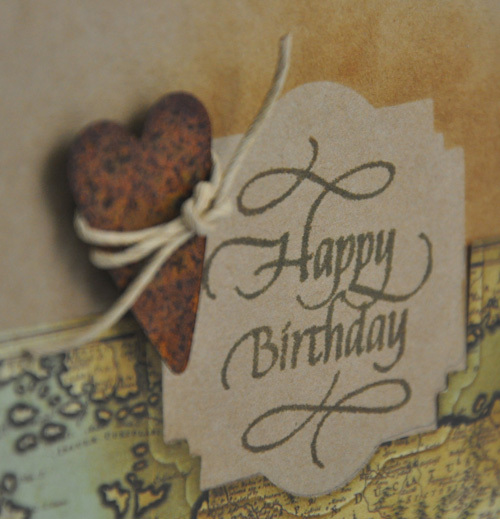 To keep the card simple and easily mailed, a sheer ribbon was used down the front. To keep from covering up any of the stamping, a small slit was cut at the top and bottom of the banner to that I could run the ribbon through. The edges of the remaining two layers of watercolor paper with sponged with the same peach ink, misted with the gold perfect pearl/water mixture and then assembled. Well, that’s all I have today. Thanks for stopping by! The main card is cream toned, side folded (5"w x 7"h). 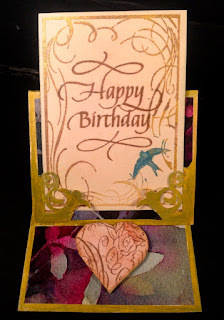 I used a Craft Concepts embossing folder (Weaving Block set) for the background, shifting it to do the full card front. Then lightly touched the high points with a sponging tool and Distress Walnut Stain pad. Next layer is the lace piece (Just Rite "Lace Background"), stamped on cream cardstock with Versafine Vintage Photo and touched here and there with Black Onyx, then clear embossed. Cut close to the stamping and sponged with Distress (Brushed Corduroy, Vintage Photo, lightly with Dried Marigold, and the edges with Walnut Stain). Adhered to card front. Adhered the glittery brown ribbon. The vase (Serendipity Stamps "Vase Set") is stamped on cream cardstock with Distress Pumice Stone and clear embossed, then colored with Pan Pastels using a Quilled Creations sponge tip applicator. Cut out and made a slit in the center vase to stuff my die cut branches through. Branches (Memory Box "Leafy Branch") die cut from dark brown cardstock. PS a quilling friend gave me one of the gold edge Reader's Digest books, so the beige toned (as in not acid free...) flowers are die cut from these pages using a Quilled Creations "Mum" die, the darker one has the gold edging which you can't really see in the image, sorry. Rolled my Reader's Digest fringed flowers around tight coils of either brown or bright yellow paper. Adding a small rhinestone in the centers. The white fringed flowers are die cut from Arches Text Wove paper - a really great paper for quilling. 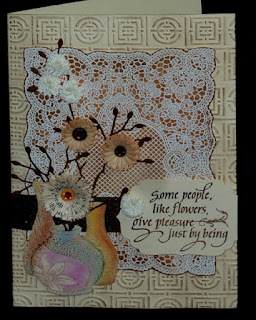 Stamped my quote (Quietfire Design) - same as lace background and clear embossed. Die cut with Spellbinders Label Four, cut off the edge on the right side and adhered to card front with a double layer of 3D adhesive tape to make it really stand up. Click on card images to enlarge. Enjoy.